Employee productivity begins with engagement. When your employees are invested in your company’s mission, culture, and long-term vision, productivity will follow. Engagement isn’t just a concern for large enterprises. Organizations of all sizes rely on their employees to drive business objectives and help build a positive brand image. Although only 34% of the workforce in the United States says that they feel engaged in their current role, there are ways to make sure your staff falls firmly within that percentage of happy, productive employees. Here are ten easy ways to keep your employees motivated to do their best each day. The first step to improved productivity starts in the hiring process. Recruit talent that will fit with and enhance your company culture. If you’re just starting to build your workforce, make sure you have a solid vision for the culture you want to build and communicate that vision to every member of your recruiting team. If you’ve already built a sizable workforce, but the culture isn’t aligning to your vision, doggedly pursue only the candidates who will help make your culture dreams a reality. It’s astonishing how quickly a few engaged employees can re-energize a company and foster a sense of teamwork and productivity. Don’t chalk culture up to a “feel good” factor when it comes to your business. It plays a major role in profitability and employee retention. You wouldn’t expect a carpenter to build a house with a banana, would you? Of course not! You would supply him or her with hammers, saws, nails-- every possible tool to ensure the successful completion of your house. The same holds true for your workforce. The right software and applications can make all the difference when it comes to heightened productivity. 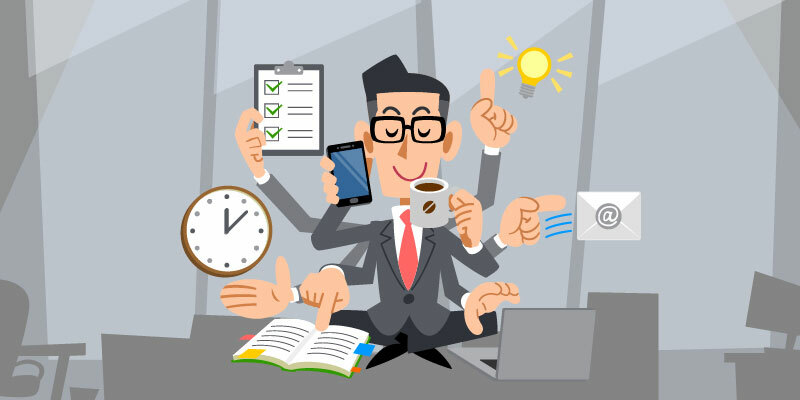 If your employees struggle with balancing time with the tasks they need to accomplish each day, offer them a time-tracking application to assign projects and associated tasks to individual team members so that each person knows what is expected and how long they have to complete each task. Communication apps are another simple way to keep communication flowing in real-time and preserve conversation history for quick reference. Unlike email, that tends to create disjointed threads and delayed responses; communication tools enable quick bursts of communication-- no matter where an employee is located. Collaboration tools work as a combination of time-tracking and communication apps to simplify group projects with dashboards and document sharing. Transparency and idea sharing are crucial for employee productivity, and collaboration tools facilitate both with a clear picture of projects from beginning to end. As Steve Jobs famously said, “It doesn't make sense to hire smart people and tell them what to do; we hire smart people so they can tell us what to do.” In other words--get out of the way and let your employees do the job you hired them to do. Looking over the shoulders of your employees instills the idea that you don’t have confidence in their abilities and are poised to correct them. By encouraging employees to take ownership of their work, you’ll give them the self-confidence and autonomy to work more productively. Regular feedback is another opportunity to use transparency to increase productivity. If your employees are not sure how they are performing against your expectations, they may develop a sense of paranoia that they could lose their jobs or that their careers will stagnate. They might also become resentful that their efforts aren’t acknowledged for their value to the organization. Prioritize employee feedback and encourage your employees to be transparent with their feedback in return. Don’t underestimate the power of a simple reward in boosting productivity and fostering company loyalty. Did your team work all weekend to meet a deadline? Give them extra time off and a gift certificate to dinner and a movie to make up for it. Does your remote team struggle to feel included in corporate office functions? Schedule a team retreat to strengthen their sense of belonging. Continuing education, book allowances, conferences, training certificates-- these are only a few of the perks you can give your team to prove your investment in them. At the same time, they’ll gain new skills and knowledge that funnel right back into the work they do for your company. If you require employees to be in the office without exception from 9 to 5, Monday through Friday, you may be harming productivity and not even realize it. Different people work best at different times and from varying locations. While many employees feel most focused when they are in the office during “normal” working hours, others may be more productive in a home office or during a flexible workday. If you’re worried about breaking out of the standard workday box, start small. Offer employees a window of flexibility, where they can come in a few hours earlier or later. If you have regular meetings or times of high traffic when you need the whole team to be present at once, set a block of time that is mandatory for in-office (or on-video) attendance. Outside of those hours, give a little wiggle room. You’ll be rewarded with a boost in productivity from employees who are free to do their best work when they work best. The American Institute of Stress reports that "workplace stress costs more than $300 billion each year in health care, missed work and stress-reduction." You can’t afford for your employees to burn out. It’s up to you to create the kind of culture that encourages self-care and good mental and physical health. If you don’t have an onsite gym, offer a discount to a local gym as an employee perk. Consult your insurance provider about employee services for mental health and preventative care, and remind your employees to use them. Above all, make it clear that your organization values the health and well-being of employees and make employees feel safe in speaking with their managers when they begin to feel overwhelmed or are in need of additional support. You’ve recruited your dream team and given them the tools and flexibility they need to be successful and productive--but your work isn’t done yet. Just like any other project or objective, you need to track your progress and measure results. You’ve heard the saying “what gets measured gets improved.” Employee productivity is no exception. In addition to obvious measurements like profitability, closed sales, lead generation, and other typical business metrics, you’ll need to dig deeper to find out how productivity plays a part (or doesn’t). Regularly send employee engagement surveys (with the assurance of anonymity) to gauge how your team is feeling about the culture, the accessibility to the tools they need to do their jobs, and their confidence in the direction of the company. Engagement is an early indicator of impending trouble when it comes to productivity. Attrition rates, both voluntary and involuntary, are also a good indicator of whether your workforce is plugged in and productive or checked out and looking for greener pastures. Lastly, scout employment boards for reviews of your company submitted by employees. You’ll get a better idea of how your recruitment, interview, and management practices are serving to attract and retain talent, and a better sense of overall engagement and brand perception. It may take some refinements and experimentation to find what works best for your team, but the investment in your employees and your culture will be well worth it.